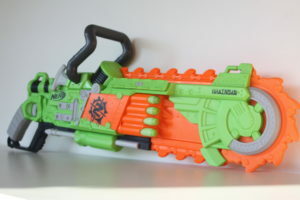 Hasbro has managed to create one hectic blaster that combines both zombies and chainsaws. 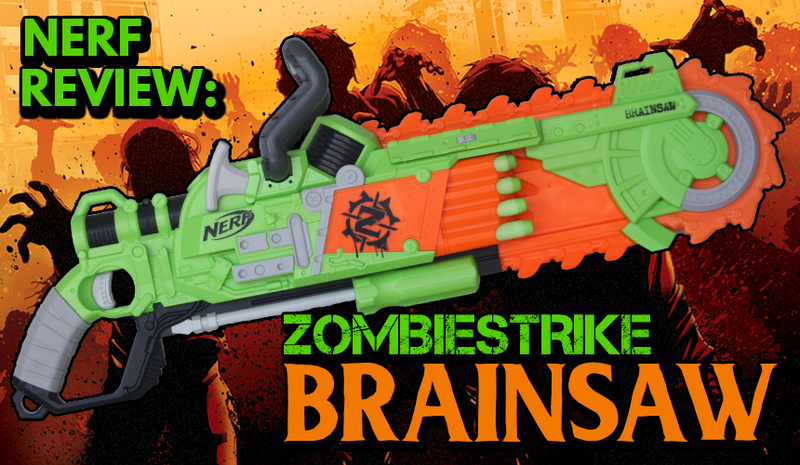 The all-new Zombiestrike Brainsaw not only fire darts at zombies but it slashes their brains out. 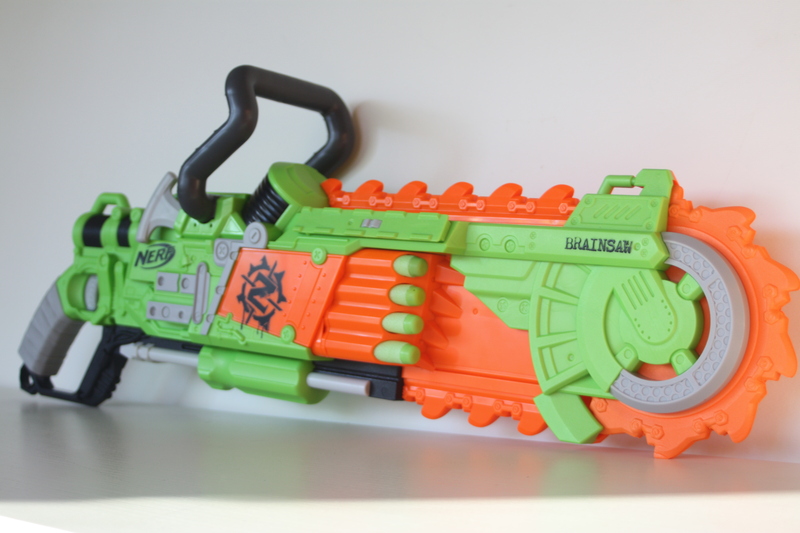 The Brainsaw certainly has the ‘intimidating’ element of a Nerf blaster. But is it practical enough to use in a battlefield? Let’s find out. Included with the Brainsaw is a handle piece that needs to be attached to the top of the blaster, it also comes with 8 Zombiestrike darts and an instruction sheet. As mentioned above, the Brainsaw certainly has an intimidating look, after all, chainsaws are menacing. 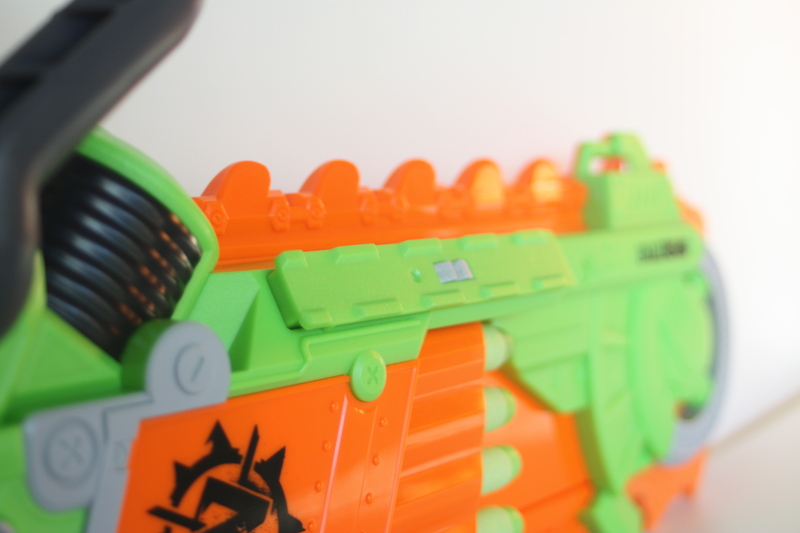 I love the detailing Hasbro has put into this blaster as it perfectly fits the theme of a zombie apocalyptic weapon. Unfortunately, the other side of the blaster doesn’t have as much detailing giving it a bland look. The Brainsaw features three sling mounts and an oddly placed tactical rail. Not sure what attachment would belong on this tactical rail. Holding the blaster is fairly comfortable and it feels just like a chainsaw thanks to the inclusion of the grey handle. 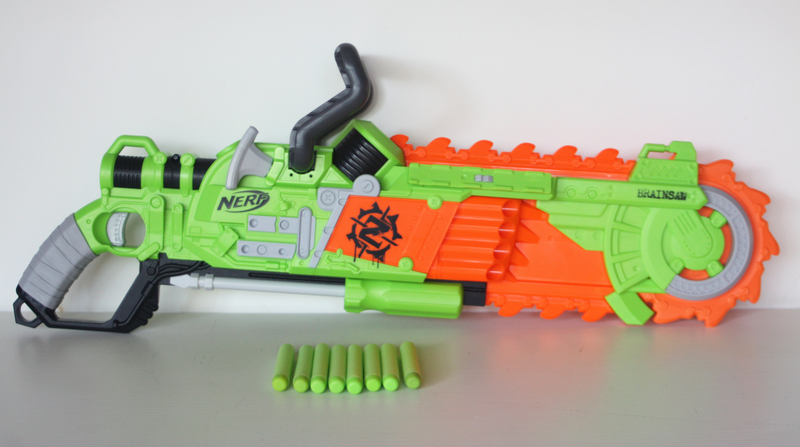 To function the Brainsaw, load up 8 darts into the 4 barrels on both sides of the blaster. 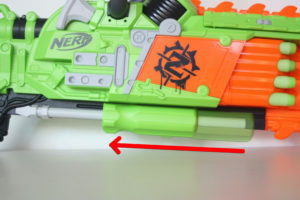 To prime it, pull and push the green handle that’s located at the bottom of the blaster. 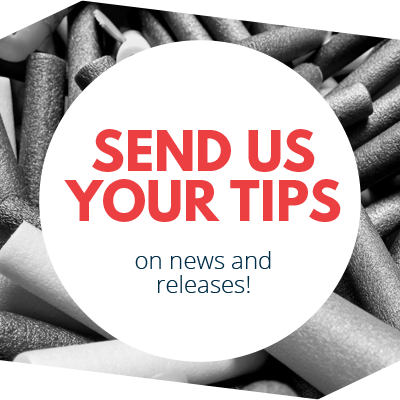 Continually prime and pull the trigger of the blaster to fire the rest of the darts. The Brainsaw also features slam firing and does a good job at it. 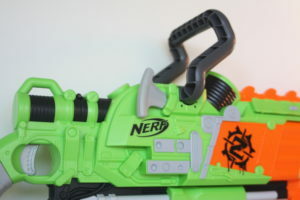 Sadly, this blaster only fires one dart at a time (many people including me, hoped the blaster would function like the Roughcut, being a multi-shot blaster). As you can see in the image below, it’s a very small prime for this blaster. The performance on the Brainsaw is quite pathetic (keep in mind, I am reviewing the Grey trigger version of this blaster). The only time this blaster is going to achieve decent ranges is when the darts are fired out of the top two barrels. Most flat shots seem to get around 10-11 meters. The furthest shot I’ve managed is 17 metres. I will not understand why Nerf didn’t use the same internals of the Roughcut for this blaster as the main blaster unit of the Brainsaw is approximately the same size as the Roughcut, so Hasbro could have easily used the same internals. Why you do this Hasbro?! The main novelty feature for this menacing weapon is its spinning chainsaw blade. Obviously the spinning part of the blade is made out of foam while the other part of the chainsaw is plastic. It would’ve have been nice if the entire chainsaw was foam as it could be used as a melee weapon. To spin the blade, just yank out the handle on the side of the blaster and watch the blade spin. This little novelty feature is fun and enhances the feel of holding a chainsaw. The Brainsaw is a fun and gimmicky blaster to use but sadly that’s as far as it goes. 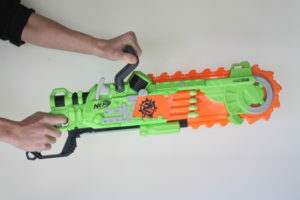 While Nerf has done a fantastic job designing this beastly weapon it’s an underperforming Nerf blaster. The Brainsaw has a decent dart capacity, a fast fire rate and an intimidating look but its power is what really let’s it down. I purchased this blaster for a whopping $50 Aussie smackers at Mr Toys Toyworld. Remember, Mr Toys Toyworld tends to have their prices higher than usual (think of it as a localised version of ‘ToysRus’). When the blaster comes into other stores it should be much cheaper. 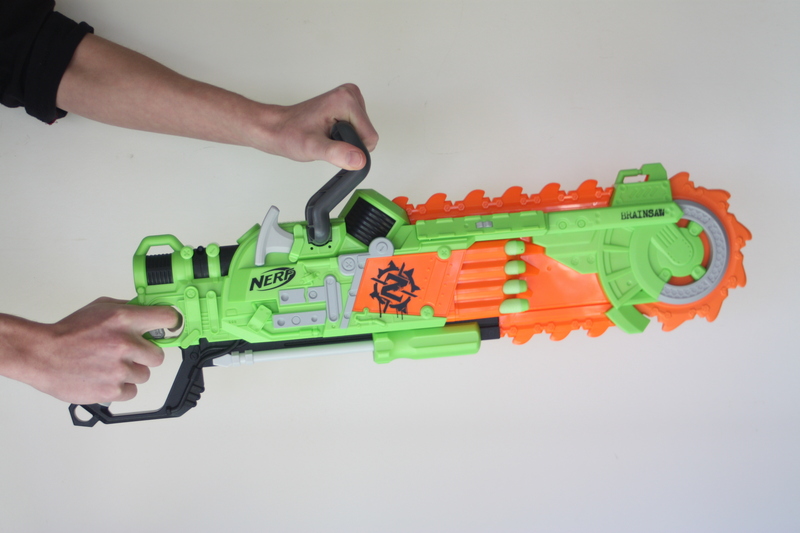 Even if the blaster were something around $35 to $40 I still wouldn’t recommend it, but if you really appreciate it’s aesthetics, go ahead and buy it. I’m sure it would be a great prop to use for cosplay. Anyway, I hope I’ve helped you decide whether the blaster is worth purchasing. 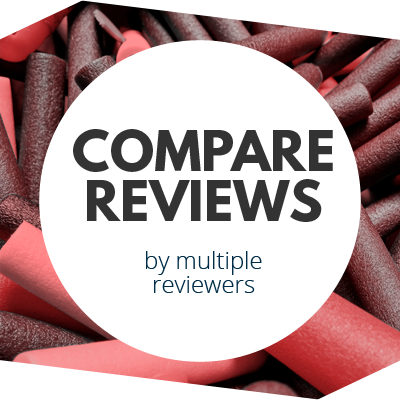 This entry was posted in Dart Blasters, Reviews and tagged australia, blaster, blaster hub, brainsaw, chainsaw, fun, grey trigger, nerf, review, zombiestrike on May 27, 2016 by JJ Reviews.